If you are looking for the popular brand of pressure cookers in India, take a look at our article. We are providing expert guidance to get the best brand. Pressure Cookers are one of the 'must haves' in any kitchen; especially in the Indian kitchen where most of the cooking is done using the same. The housewives need it to make the daily food items; working women need it to make the 'quick' things; bachelors and people living away from their homes and are not expert at cooking need it to make occasional rice and other such things and last but not the least the commercial kitchens need them to make the food in bulk within minutes. The pressure cooker is that single item in the Indian Kitchens without which cooking is not feasible at all. It is used for boiling, steaming, cooking, and lots of other purposes such as making fermented items; e.g. Idlis etc. Having understood the importance of Pressure Cookers in India; let us explore the top brands one can choose while making the purchase. The list has been arrived at after comparing the brands on various factors such as price to quality ratio; price to features and size ratio; material type and size etc. Having gone through the post and read about the popular Pressure Cookers in India in detail, you will be able to make the next purchase intelligently. Chakson is a name that translates into quality, economy, long-term usage, easy and efficient cooking and safety. The Pressure Cooker is made of pure aluminum and comes in a shiny finish. The cookers are available in different sizes and come with a Metallic Safety Plug and Gasket Release Function to ensure safe cooking and handling. The cooker material is scratch resistant and BIS certified. The Chakson Pressure Cooker has an efficient working mechanism and ensures saving of time, money and energy while cooking. 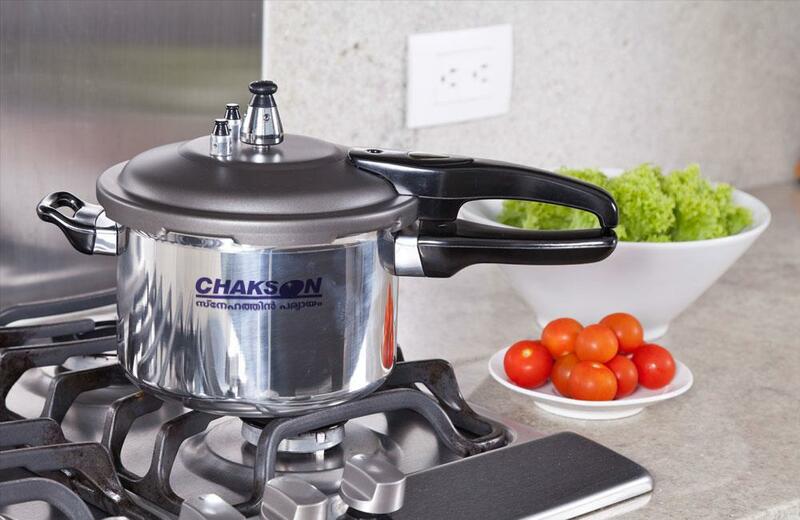 The Chakson Pressure Cookers are available in models that are suitable for gas cooktops as well as induction cooktop. If you wish to buy pressure cooker online with high quality, you can also go for the hard anodized aluminum models that come in different sizes with Chakson, one of the best pressures cookers in India. The material used for making the pressure cookers is of very high quality so as to provide a long life and safe cooking. So one doesn't have to worry about cooking with a pressure cooker. The BIS certification ensures safe cooking so that you don't have to worry about any accidents that might happen in the kitchen. Chakson thermal Pressure Cookers and Chakson rice cooker come with a perfect 'Price-to-Quality' ratio. One doesn't have to worry about the Chakson pressure cooker price while going for quality as quality and economy go hand-in-hand. Nolta is another very popular pressure cooker brand that offers different types of models in different types of materials. The pressure cookers come in different sizes ranging from small to large and are thus suitable for all kinds of family sizes. The main features of the Nolta Pressure Cookers include the precise pressure regulator, auxiliary handles, high-quality rubber gasket, fusible safety valve, and washer. The cookers are available in both the gas cooktop and induction cooktop versions. Prestige is one of those names that have always stood as an epitome of perfection and quality. The pressure cookers come in different sizes, colors, styles, and shapes. The one thing that makes the brand to feature at number 3 in this list, as one of the best pressure cookers in India, is the fact that the price to quality ratio is high as compared to the Chakson; which is why all the people are not able to afford them. The cookers from Prestige come in stainless steel, aluminum, hard anodized aluminum; with outer lid and inner lid and lots of other options. The Pigeon Pressure Cookers are yet another popular name in the Indian households. The cookers come in lots of sizes and styles. Pigeon manufactures models suitable for induction cooktop as well as the gas cooktop. Pigeon pressure cookers come in aluminum, hard anodized aluminum, and with inner and outer lids. The material used in utensil manufacturing is of high quality. Though the name is famous and the products are of good quality, the price is high as compared to the Pigeon and Prestige Pressure Cookers. There are different types of models that are suitable for both the gas and induction cooktops. The various collections of cookers by Butterflies are Pearl Plus, Curve, Blueline, Durabase Plus, Durabase, Standard, Elegant Plus Outer Lid, Standard Plus, Superb Plus and Standard Plus Inner Lid. Hawkins is one of the most famous and oldest brands in the world of Pressure Cookers and the models, styles, features, and quality offered is unmatched. As the price to features and quality ratio is higher as compared to the Chakson and other brands; the name has been placed at the sixth position. Hawkins manufactures stainless steel, aluminum, hard anodized aluminum, induction pressure cookers and gas based pressure cookers in different shapes and sizes. Futura is yet another high-quality brand that offers dozens of styles, sizes, and types of pressure cookers. The prices are high and thus the cookers are affordable for people with the decent budget. The different ranges of pressure cookers from Futura come at different prices with different sets of features; that decide the price of the final product. The list has mentioned all the popular brands of best pressure cookers in India and we hope that your next purchase is well informed and well-placed-in-your-budget. Happy shopping and Happy Cooking..!! A very exhaustive and informative article regarding the various pressure cookers available in the market. As a housewife, I would like to have a pressure cooker which has a good steam vent system and a good quality sealing gasket to avoid any leakage. A pressure cooker is such an item in our household that its good performance is a prerequisite for smooth preparation of food. So we should select a pressure cooker in the market keeping these things in mind. Nowadays due to competition and commercialization, new products are being introduced in the market but we should go for the already established brands until unless some compelling reasons are there to purchase a new hi-fi model.